A talented boy named Christopher was not indifferent to cinema since childhood. His first "home-movie" he tried to shoot, barely ten years old, armed with his father's 8-millimeter camera. The main roles in the first "movies" of a small fan of the "Star Wars" were played by the toy soldiers donated by the father (unfortunately, the permanent companion of Christopher's film career, Michael Kane, at that time was "intercepted" by Richard Attenborough for filming in another war movie). Almost 30 years of persistent directorial work. 9 full-length films, each of which is not familiar with the rental fiasco. Total fees of more than $ 4 billion for all work and a "loud" name. In the age of glory sin can not remember youth? And so, in the jubilee project, "Dunkirk" - Christopher Nolan returns to his first "director's" experience - military history. Only "soldiers" this time - not a toy. Taking your favorite 70-millimeter film, a lot of natural scenery (minimum digital recording and green screens, gentlemen, only old school), loyal comrades (Zimmer, Van Hiteim, Crowley, Smith), and got several working "Spitfires" and "Messerschmitt", Christopher says: "I want to shoot a visually beautiful movie." 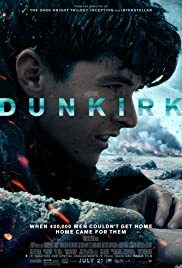 And in Dunkirk he did it in his corporate style - with the inherent color effects a la "The Dark Knight", the epic scenes of air battles, the sinking of ships and the endless "bombing" that look no less qualitative than the fall of Cooper in Gargantua or a scene with a wave in Interstellar. But this was clearly not enough. And Christopher Nolan proclaimed: "More realism!". Operator Hoyte Van Hoytem should not be repeated twice. He unhooked a 100-kilogram IMAX 3D camera from a suspended tripod and, in an old-fashioned way, took off all the "ground" scenes from his shoulder. 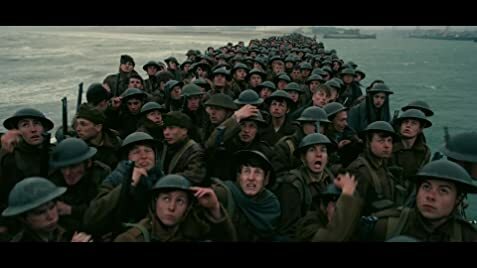 Voila, "Dunkirk" becomes the first film where IMAX shooting was done "by hand" - the work received a lot of realistic scenes from the face of desperate British troops, filled with panic, Nolan confirmed the title of "experimental film-maker", and Van Hoite moderately missed the gym . Ideally. "Dunkirk" is a screen reproduction of the famous in the history of Great Britain operation "Dynamo". In 1940, nearly 400,000 discouraged allies (mostly British) were pushed back by the German army to the small French port city of Dunkirk, on the English Channel. In conditions of total economy of military resources, involving civil courts, Great Britain begins the largest rescue operation. Christopher Nolan offers us his vision of these events and gives us a chance to look at them from three angles. Firstly, from the air - on behalf of the pilots of the Royal Air Force, at all times seeking through the strait to help their associates. Secondly, from the sea - on behalf of the crew of a small civilian ship, which is also sent to Dunkirk to assist in the evacuation of the British corps. And, thirdly, on behalf of desperate soldiers, who are eager to survive and get home, at any cost. Christopher Nolan, in spite of his fears, was inspired not by the Spielberg story of the salvation of Private Ryan and not even by Stoun's "Platoon", but (!) "Nonstop action" - "Speed" and "Unmanaged." The genre of "Dunkirk" smoothly balances between the "vigorous" thriller and worthy "war-movie", and the suspense - just off scale. In addition, the director immerses us in a non-linear narrative, saturated with flashbacks and endless action in the spirit of the film "Remember." We can observe the picture of the bombing of the shore from the land, and in a few minutes - the same scene, but already from the fuselage of the Spitfire. A few words about music. Oh, the seventh was scorching. Hans Zimmer, are you human? From the very first minutes, the soundtrack began, which did not end at all until the final credits, alternating only its tempo. Due to this, "Dunkirk" looks in one breath, in the truest sense of the word. I do not want to go into a detailed description of the impressions - I just wait for Zimmer's music to be called the classics of the 21st century. But fans of the deep "Nolan" story are waiting for the sad news. In "Dunkirk" the director, not wishing to go beyond the historical framework, relied on reliability and coverage. There is a minimum of metaphoricality, a minimum of a unique fantasy, a minimum of understatement with respect to the plot and a maximum of understatement with respect to the characters. Calling the main character (Finn Whitehead) by the name "Tommy" (if we collectively called the Germans "Fritzes", the Germans generally called the British "Tommies"), Nolan seems to seek to "generalize" and project on his fate and feelings the experiences of all who was in this situation - to create the effect of an impersonal mass. All this reminded me madly Remarque and his "On the Western Front without Change" - a real war, without "superheroes" (and was it not for this that the "eminent" cast was slightly overshadowed? ), Impregnated with despair, a thirst for survival and whistling bullets from an invisible enemy. Caesar could simultaneously read one text and dictate another. Walter White - at the same time teach chemistry and "cook meth." Well, and Christopher Nolan damn well knows how to combine the position of a talented screenwriter and an unrivaled director. And, perhaps, he once again proved it. "Dunkirk" is the tenth, anniversary work of Christopher Nolan. "Powerful" historical film with an invigorating suspense and dizzying visualization. A minimum of digital effects, a maximum of material props and "cardboard" decorations - a balm for the soul for all fans of the "old school" of cinema. Unfortunately (or not), the "genius" of the play played to the detriment of the "uniqueness" of the script - the fans of "Beginning", "Prestige" and "Interstellar" will definitely wait for some disappointment. In all other respects, the signature handwriting of the master of a large-scale movie is felt in every minute of the time-keeping. You will like this movie, ladies and gentlemen, rest assured. Enjoy watching! 133 of 218 people found this review helpful. Was this review helpful to you?